Hannah Hunsinger | The Collegian Valeria Guizado, sophomore in biology, crowed 2014 Miss KSU Bellaza Latina at the competition in the KSU ballroom on Saturday, April 19. 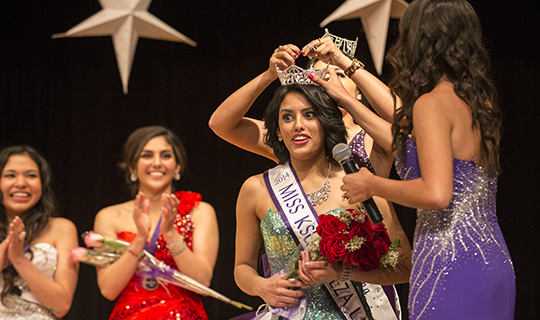 The third annual Belleza Latina pageant was held in the K-State Student Union Saturday night. The pageant was a chance for students of Latin American descent to earn scholarships while showcasing their heritage. “The main purpose is to give Latina students an opportunity to express their culture,” said Jeff Andrade, senior in electrical engineering and president of the Hispanic American Leadership Organization, the host of the event. Valeria Guizado, sophomore in biology, took home the grand prize and title of Belleza Latina 2014. The first runner-up was Priscilla De Los Santos, graduate student in public health. 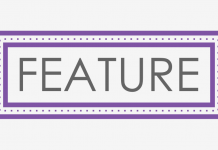 Andrade said his organization promoted the event in a number of ways, including a booth in the K-State Student Union and holding an information session where prospective participants could learn about the pageant’s requirements and purpose. After that, applications were accepted and the participants chosen. 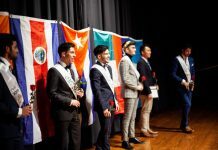 The event featured six K-State students of Latin American descent competing for scholarships and the title. Andrade said the application had some of the generic scholarship-type questions, as well as an essay portion. Participants were rated based on interviews with the judges the morning of the pageant, a talent competition, an “evening portion” in which contestants wore evening dresses they chose themselves, and on-stage questions answered live in front of the audience. The audience was also involved in how awards were given out at the competition. Through the course of the event, audience members were asked to vote on the event’s Facebook page for the competition’s “Most Photogenic” category. Audiences members were also able to vote for a “Fan Favorite” award. The winner of each category received a $100 scholarship. Krystal Martinez, senior in animal sciences, won both awards. Mike McFadden, Wamego resident, attended because his niece was one of the participants. He liked how the audience got to vote, he said. Ashley Wooten, senior in political science, said she attended to support her friend participating in the event. The night was a celebration of different cultures coming together and sharing similarities while promoting scholarship and beauty, Wooten said.